The finale of 'Tartuffe' in the Mad River Festival at Dell'Arte. In his roundup of summer Shakespeare in the Bay Area, San Francisco Chronicle drama critic Robert Hurwitt noted the predominance of plays dealing with "bloody, conniving or inept abuses of power," including five separate productions of Macbeth. Even the four productions of The Tempest fit the trend, he writes, since "as famous as it is for reconciliation, that outcome hinges on the impeachment and removal of a corrupt ruler from office." The political Zeitgeist is reflected in a different way at the upcoming Mad River Festival at Dell'Arte. "There's a theme that runs through the festival this year," said co-Artistic Director Michael Fields, speaking on a cell phone from a sidewalk in Minneapolis where he was attending a conference of the Theatre Communications Group. "The plays deal with our arrogance in thinking that we're right, and if everybody understood this and behaved just as we do, everything would be much better." He identified this tendency as "hypocrisy," though it might be more accurately called self-righteousness, but its expression in dogmatic religion and ideological politics has been widely noted as bitterly characteristic of our times. It is a theme, Fields said, that runs through the first festival offering, the Dell'Arte Company's own Tartuffe (opening June 21, final performance on July 1), as well as the Dell'Arte Youth Academy productions (two plays under the banner of GenNext on Stage, July 5-7) and the visiting production, The Greatest Story Never Told, an original work by a Virginia-based ensemble of mostly Dell'Arte alums called Creatively Independent (July 12-14). I'll have more on the later productions as well as thoughts about the festival itself next time. For now, the first play up: Tartuffe , the classic 17th century comedy by Moliere, which does deal with the hypocrisy of religious zealots who accept whatever one of their supposed adherents does -- including actions contrary to their own dogma, as well as more widely recognized crimes -- as long as their particular version of "faith" is professed. Just about everyone else is also fooled, which makes for high comedy on stage, though we are witnessing its tragic outcomes unfold this summer on larger stages where it's for real. It not only has obvious applications to our time, but was proven to be an accurate reflection of Moliere's when members of the Church had it censored and banned from production. "It's a great play -- one of those timeless pieces," Fields commented. "I feel like Moliere is the grandfather of our company in so many ways, because it's that mixture of physical work with really strong content, but not in a didactic or preachy way -- in a way that is involved in character. And it's very human. It is really the human comedy." This particular production is unusual in that it began not in Blue Lake but at the Marin Theatre Company (which, as Fields points out, is the third largest theatre in San Francisco). Frequent Dell' Arte director Giulio Cesare Perrone, who had worked at Marin as a designer, proposed doing Tartuffe there with the Dell'Arte Company. The result was some 30 performances in November and December. "We created the work," Fields said, "and they built the set that Giulio designed. They produced and promoted it, and paid us well to fill a five-week slot in their season, which is unusual, but it's ideal for a company like ours. "We thought it would be a great way to start the festival, because we have a production that is fully mounted. We bought the set and we're using it for this production. It's probably one of the most visually striking sets we've ever had." 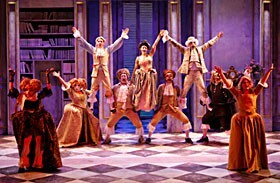 Except for the addition of Deborah Taylor, well-known in the Bay Area, the cast is composed of Dell'Arte regulars, with Michael Fields in the title role. Perrone's concept is to combine Italian commedia with Moliere's French theatre, including such classic commedia figures as Pantalone, "the oldest character in the play," Field notes, "played by the youngest member of the company -- Adrian Mejia, who is only 25. He does a great job." Tartuffe is in the outdoor Rooney Amphitheatre, and because of Blue Lake's noise ordinance mandating that the show must be over by 10 p.m., Fields has shortened the script somewhat. There will be live music in Afro-Cuban style, suggesting the colonialism that the attitudes in the play enabled. "That's talked about in the play, too. We've added some pre-show music and integrated some `carnivale' aspects into the production, particularly because it's outdoors," Fields said. "But once we get into the piece, we really are doing Tartuffe ." Returning to Robert Hurwitt for a moment, his mixed-to-negative review of this Tartuffe at Marin was grossly distorted in the Marin Theatre publicity to make it sound like a rave. Out-of-context and therefore mendacious quotes are unfortunately standard these days, but agree or disagree with his conclusions, such misrepresentation applied to a play about hypocrisy is disconcertingly ironic. Though after one viewing I'm not sure the various levels of metaphor or elements of structure worked as well as they could, at its heart it was courageously uncompromising as well as relevant to its audience. It was a winsome and bracing presentation that remains with you and inspires further consideration, and a terrific example of what else theatre can do beyond our usual fare. Thanks to Fuller's ensemble, Independent Eye, and the Arcata Playhouse for bringing it to us. Next up at the Arcata Playhouse is a benefit for the Humboldt Community Breast Health Project, a "titillating cabaret" called Thanks for the Mammaries, this Friday, June 15, at 8 p.m.
More at stagematters.blogspot.com. You can leave comments there, or e-mail stagematters@sbcglobal.net.